When we hear of someone who has caught their fingers or hand in a door and has a resulting injury, we generally think that they must have had their hand around the area where the door handle closes and that the door slammed on them. This is an occurrence unfortunately, but one of the more dangerous causes, and just as common if not more, is the DOOR JAMB area of the door. We tend to pay less attention to this high risk area when we have our hands hovering around it, and because we are not expecting it the injury can be more nasty. For children and toddlers it is even more dangerous due to the facts that their fingers and hands are much smaller and fragile and also because they would be less aware of the dangers a door can present. The wide gap of the door jamb is by far the most common area where fingers become trapped due to the ease of accessibility for digits into this space, particularly when we are least expecting it. But especially for young children who are naturally adventurous and curious, they tend to use their hands and fingers to investigate further and in the case of doors, sometimes with drastic and painful consequences. However, the hinge side can also present its own danger point. It can sometimes be neglected when it comes to safety proofing the door. Because the gap can be negligible when the door is closed, it suddenly becomes enlarged when the door is open and presents itself more for a toddler or young child who may be positioned behind the door to possibly try and insert their small fingers into it. The injuries caused can be just as bad as the wide gap on the other side. The image (above right) shows what I am referring to when the door is open and the pencil being the approximate size of a child’s finger is able to fit through the gap. The wide gap of the door jamb would always require a guard cover because of easy access for the hand and finger to slip into it, but what about the hinge side? Naturally because cost can be an unwelcome part of our consideration when it comes to safety proofing, a question arises on whether we need to use a Finger Protector strip on the hinge side of the door. What may help in assessing this is to look at the position of the door in the room. If the door is opening against another wall i.e. it is in the corner of the room, it may be not too easy for a child to be behind the door to put their finger in the gap, or at least the chances for them to do so are slimmer when the door is being opened or closed – it would be more a case of the child getting bumped by the door when it is being opened. If the door though is positioned partially along a wall, it is then possible for the child to be behind the door when it is opening and closing and have the opportunity to place their fingers near or into the gap as the door is being opened or closed. My own advice would be to err on the side of caution and also install Finger Protectors on the hinge side of the door but if it is a case of trying to keep costs down then it may be that you have to be selective about the doors whose hinges are covered along with the wide door jamb gap. The two images below show what I mean about the position of the door along the wall. HOW DO I SELECT THE RIGHT PRODUCT FOR MY NEEDS? First you need to decide on who you are trying to protect from catching their fingers in the doors. If you are mainly concerned for babies and toddlers and generally kids under 5 years of age then the Finger Protection 1.2 Meter strip would be sufficient for childproofing. It reaches a little more than half way up the door and just high enough to stop a child of this age to reach over and stick their finger in the door gap. If however you are concerned for older children, teenagers and adults e.g. schools, commercial premises and public buildings then I would recommend the longer Finger Protection 1.8 Meter strip that more or less covers the length of an average 2 meter door. Older children and adults can unfortunately be unaware sometimes of the risks associated when opening and closing doors and we do get a lot of calls and enquiries from administrators of schools and public buildings where accidents of this type have happened. In these cases sometimes it is not uncommon for legal proceedings to follow. The Finger Protection 1.2m & Finger Protection 1.8m can open to 110 degrees approximately which in most cases is entirely sufficient. However if the door can be opened approx 180 degrees as in the case of some double fire doors in larger buildings then I would recommend the Finger Protection Pro Kit (see images below) which consists of two strips in a kit– one for the wide door jamb gap and another for the narrow hinge gap side. These strips facilitate the opening of doors 180 degrees around to the adjoining wall or partition. As I mentioned at the beginning, SLAMMING DOORS on the handle side of the door are normally what we think of when we hear of finger injuries from doors. We do have a product for that in our range called Happy Fingers. Besides it’s main purpose of preventing a door slamming completely closed on our hand or fingers, it’s other job is to visually alert us to the risk of this possibility. The white hard foam hand brings our intention (children too) to the danger of getting our hand too close to the edge of a fast moving door. 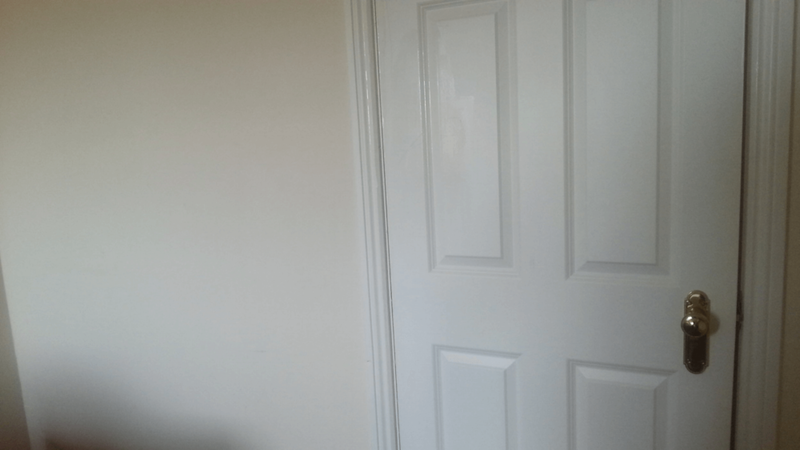 Its advantage over the cheaper door foam hooks that we see on doors is that it is fixed permanently to the door and will not be lost. So as not to be of interference and prevent the door from the ability of ever closing it has a simple twist mechanism that like an on/off switch allows it to be positioned to allow for complete closure of the door when necessary. A very useful safety product when windows and other doors are open around the building and air circulating can cause the doors to unexpectedly slam closed. Both the 1.2m & 1.8m strips that open up to about 110 degrees are transparent and therefore suit all interiors and decor. You will be quite surprised that after a very short while you will not even notice them because they blend in so well with all colours. The 180 Degree Pro Kit is white in colour and this would be considered useful in that it brings the safety aspect of the fixture to the attention of anybody while present on your premises. The 1.2m and 1.8 transparent strips are first attached using the adhesive tape already applied to them. We then recommend the use of small screws spaced approx 30cm apart if they are being used in creches, schools and buildings where the public roam. If being used in the domestic household there is generally no need for screwing them in. We do not supply the screws. You can buy these very cheaply off your local hardware store and they would be only happy to advise which type of screw to use depending on the type of surface they are being used for i.e. aluminium, PVC, wood, etc. The average time for a non DIY enthusiast to install these is 5 to 10 mins per strip. The Pro Kit would require a little more time but would be seen also as an easy DIY job. WHY CHOOSE OUR FINGER PROTECTION PRODUCTS? Quite simply because it is German TUV certified and the very best on the market for its price. Durable and an easy DIY installation. The strips have been tested for over 250,000 openings – That’s the equivalent of a door being opened 137 times a day over 5 years or 69 times a day over 10 years. Please read our testimonials to see what our genuine happy customers have been saying. Many times we would get orders based on the high recommendations of our previous customers. Please complete the form below to reveal an access clickable link to a PDF printable file of this page which will open up in a new window.